If you’re considering a career in welding, refining your skill in the most-used types of welding will often help to provide secure employment for years into the future. With a seven month professional welder program, you can average a higher yearly income1 than the average of all career paths in the United States. Here is more information on SMAW, the most common welding form used worldwide2. What is SMAW Welding Process? 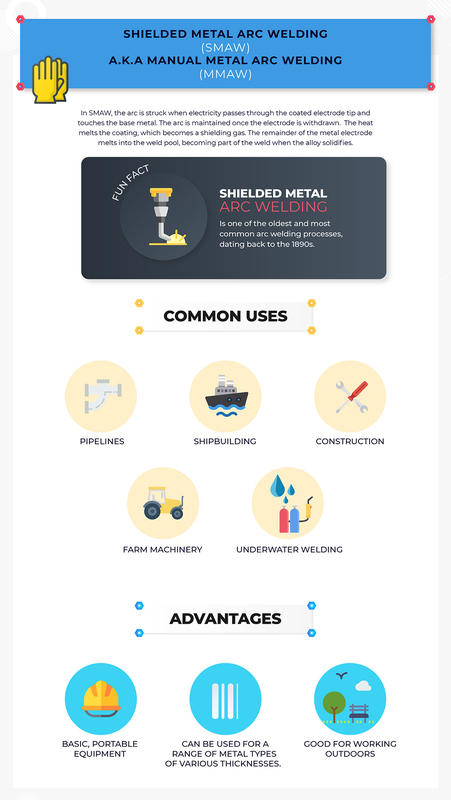 Shielded Metal Arc Welding, otherwise known as manual metal arc welding or flux shielded arc welding, is a process that uses a flux-coated electrode to form the weld. As electricity passes through the electrode, the flux forms a gas, which shields the electric arc in the space between the electrode and the metal being welded, preventing contamination from atmospheric gasses in the weld. This process is fairly simple and doesn’t require much in the way of specialized equipment, making it very popular. Quality issues that can arise from the SMAW welding process includes porosity caused by gas in the weld that did not escape before the metal solidified, leaving the weld weak due to gas bubbles, splatter caused by low voltage or high amperage, poor fusion from dirty metal or low power, shallow penetration caused by too fast of a travel time, too low a current or too large an electrode, and cracking caused by the above issues as well as not allowing movement in the weld while working and using inappropriate metals in the piece. In metals that are less than optimal,￼ use a slow travel speed that will keep the puddle molten and give gases a chance to bubble out, creating a strong weld. If you’re welding thinner stock, between 10-18 gauge, place your work at a 45-75 degree slant so that you can get the fastest travel and don’t make the joint too wide or you may risk burn through. If you’re working with heavier plate that is 3/16″ or heavier, work the weld flat to allow for the best electrode placement. Like any tool, welding equipment must be respected, but not feared. Any type of arc welding involves high voltage and amperage electricity, which can be dangerous if the proper precautions are not taken. Burns from the heat of the torch or electrical conduction can be serious and even life threatening if electricity passes through the heart. To protect yourself while welding, basic personal protective equipment must be worn. This includes, at a minimum, heavy leather gloves, a long-sleeved jacket and a welding helmet. Ultraviolet light released during the welding process can cause retinal burns and permanent eye damage if the filter in the helmet’s faceplate does not protect your eyes. Additionally, the welding process can release gasses that can be harmful to your health, so providing sufficient ventilation is important.